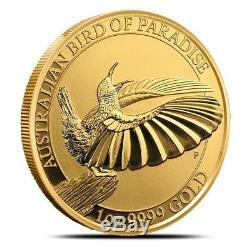 9999 Fine Gold Bird of Paradise Coin In Cap. The bird of paradise is famously associated with northeastern Queensland and the island of New Guinea, where local tribes use its beautiful plumes as currency. One vibrant example of the bird of paradise is Victoria&###x2019;s Riflebird, which was named after Queen Victoria I when it was first spotted by Europeans in 1848. The male bird&###x2019;s striking color, similar to the uniforms of British riflemen at the time, earned the bird its name. The 2018 1 oz Australian Gold Bird of Paradise Coin is beautifully struck in. Only 5,000 of this inaugural gold coin will be minted, so add this collectible new release to your collection today. Obverse The obverse depicts the right-profile portrait of Her Majesty Queen Elizabeth II. Engravings include "Elizabeth II, " "Australia, " &###x201C;2018&###x201D;, and 100 Dollars&##x201D. Reverse The reverse of the 2018 1oz Australian Gold Bird of Paradise Coin features the image of Victoria&###x2019;s Riflebird. Engravings on this side identify the name of the series as well as the coin&###x2019;s weight, purity, and metal content. About The Perth Mint Perth Mint is Australia&###x2019;s oldest mint, as well as the largest exporter and second largest producer of gold bars in the world. With the capability to process over 700 tons of gold per year, the Mint is one of the most efficient refineries active today. The Perth Mint belongs to a prestigious group of gold refiners who have accreditation from five of the major gold exchanges. As a member of this elite group, Perth mint products are trusted by investors and collectors worldwide to meet the highest weight and purity standards. Orders of 20 or more coins arrive in tubes, and quantities of 100 or more arrive in mint-issued monster boxes. At Provident, our primary goal is to make it simple and safe to invest in precious metals. We sell only genuine bullion products sourced directly from the mints that produce them, such as the US Mint, Royal Canadian Mint, Perth Mint, and more. In addition, our inventory holds a unique mix of products that you can only find at Provident. Additionally, our team is committed to offering exceptional customer service at every step of the investing process. You can rest easy knowing that you will get exactly what you ordered each and every time. All packages are fully insured during transit. Will I receive the exact item pictured? All photos are stock and are meant to represent the type and quality of item you will receive. Spot price is the market value of precious metals at a given point in time. Nearly all products in our store are priced at a premium or discount to the spot price. As spot price moves up and down throughout the day, so will the price of the product. How often are prices adjusted based on spot price? Similarly, our traders are NOT commissioned. What you see is what you get. Can I cancel my order? Cancellations are considered on a case-by-case basis. Is there a minimum order? There is no minimum order. Can I change my order once it has been placed? No changes can be made to the items included in an order once it has been placed, but a subsequent order can be placed. Yes, you can apply those monies at checkout. Will my order be insured? First off, we are sorry this happened. That said, it does happen, but we will make it right. We always do our best to do right by our customers. How long will my order take to get to me? This listing is currently undergoing maintenance, we apologise for any inconvenience caused. 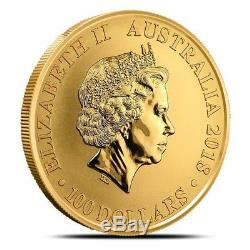 The item "2018-P (Perth) Australia $100 1 oz. 9999 Fine Gold Bird of Paradise Coin In Cap" is in sale since Friday, October 12, 2018. This item is in the category "Coins & Paper Money\Bullion\Gold\Coins". The seller is "providentmetals" and is located in Addison, Texas. This item can be shipped to United States.